Quick and easy crescent roll pizza with sausage, pepperoni, marinara sauce, and cheese. Delicious, comforting and cozy! 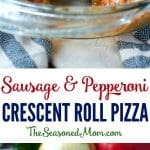 Just 15 minutes of prep for this easy dinner that the whole family loves — Sausage and Pepperoni Crescent Roll Pizza! It’s cozy, fast, and delicious! We have this routine on Friday nights. It’s an end-of-the-week treat that makes all of us very happy (for various reasons), and it always involves pizza. You see, we live in the middle of nowhere, so meal delivery options are non-existent (that’s right — we don’t even have a single restaurant or fast food joint that will bring food to our doorstep)! 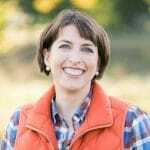 Instead, if we want to dine out, we can either drive 30-45 minutes to the nearest bigger town, or we can rely on a few little restaurants that we have in Madison for the basics. Fortunately for our pizza-loving family, two of the local options specialize in Italian food AND do a nice carry-out business. As a result, we indulge in pizza (that we pick up ourselves) almost every Friday evening. It’s one of the boys’ favorite meals, and I get the night off from the kitchen. Win-win, right? Because by the end of a crazy week, I often can’t muster the energy to do much more than DRIVE to the restaurant to pick up our food! 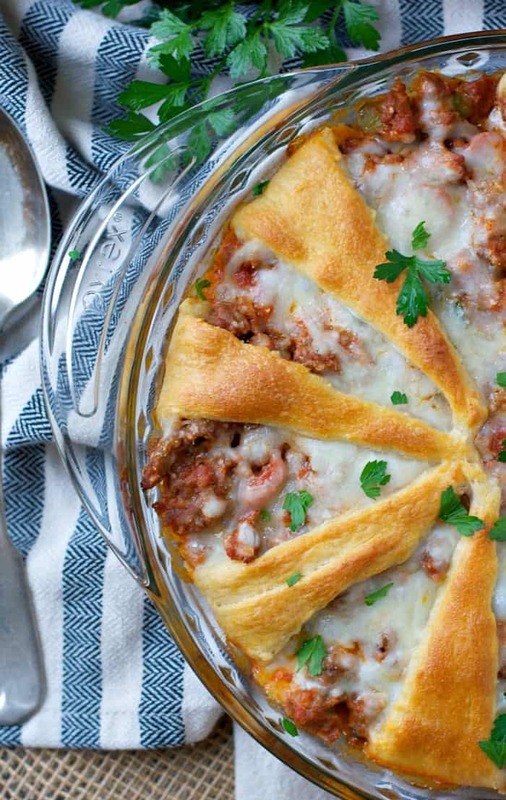 Keith’s first choice for pizza toppings is always sausage and pepperoni (or the “Meat Lover’s”), so imagine his surprise and utter delight when he came home from work recently, sat down at the dinner table, and was presented with THIS crescent roll pizza — and it wasn’t even a Friday night! 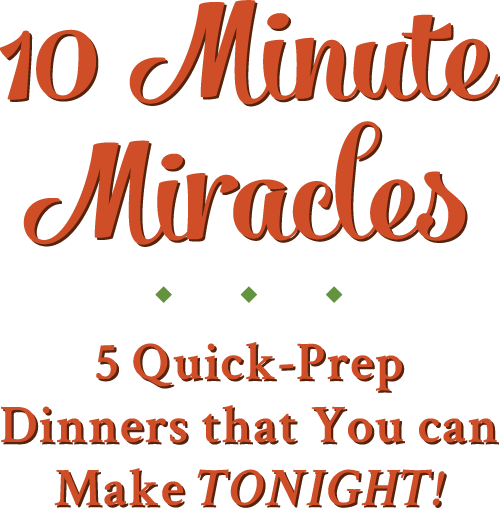 Best of all, this meal only requires 15 minutes of hands-on time and you can prepare it in advance if that suits your schedule. In fact, maybe this dinner needs to become a part of our Monday routine?! The smaller you dice the veggies, the less detectable they are by picky little eaters! TO PREP AHEAD: You can prepare the filling in advance so that you only need to put it in the crust at the last minute. 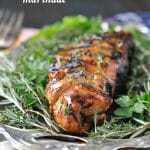 To do this, cook the meat and veggies according to directions above. Stir in marinara and cheese, and transfer to a container. Cover and store in the refrigerator for a couple of days, or even freeze it! When you’re ready to use the meat, you want the meat mixture to be warm (or at room temperature) before adding it to the crust. I simply microwave the meat for 1-2 minutes and then proceed with instructions in the recipe card below. COOKING FOR JUST TWO? You can divide this recipe into two separate casseroles. 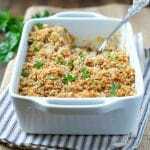 I would suggest using two small casserole dishes (such as these rectangular 7 x 5-inch dishes that I use). Just place 4 crescent rolls in each dish to form the crust. 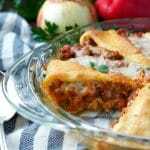 Divide the filling and cheese among the two mini casseroles. Bake one casserole for dinner, and wrap the other casserole tightly in saran wrap and foil. 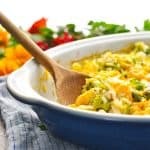 Freeze the extra casserole for up to 3 months. 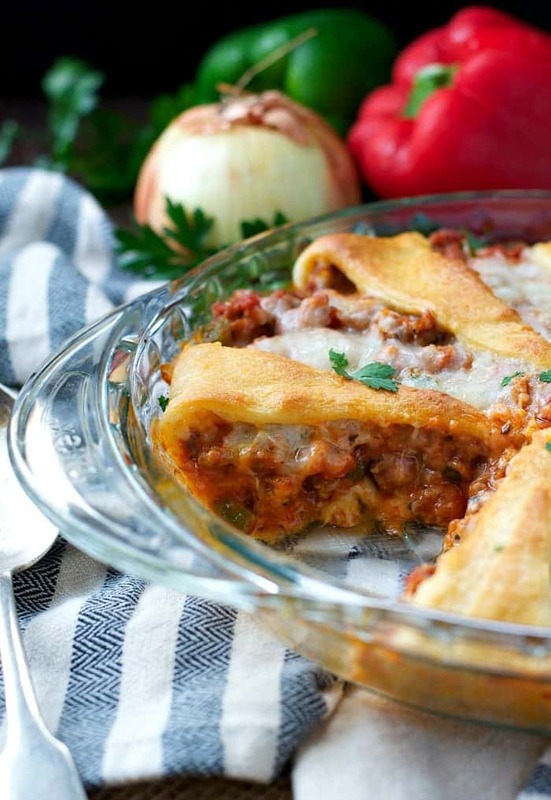 When you’re ready to bake the frozen casserole, simply thaw it in the refrigerator overnight. Then bake according to the instructions above until heated through. Separate dough into 8 triangles. Place dough in an ungreased 9-inch glass pie plate with the narrow, pointed ends overlapping the edge of the dish by a few inches. Press dough into the bottom and sides of the dish to form a crust. Just when I though it doesn’t get any better than homemade pizza, you go and add crescent rolls on me. This looks absolutely to die for! My kids are going to go insaaaane over this! Pinned to my Dinner Board!! This sounds yummy and easy! 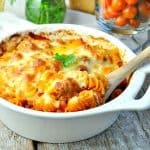 I think this will be another hit with the family —just like all your other recipes we have made from your blog!!! ? Thanks for the pin, Kelly! I’m so glad that you might try it. My kids love it, too! I love pizza night…this is such a great way to switch things up and it sounds absolutely delicious!